FDuring East Harlem’s annual Party on Park festival Sunday, children giggled and screamed inside a bouncy castle, the Department of Transportation passed out free bike helmets and health care workers trained almost 130 people to use the anti-overdose drug Narcan. “You’re going to do the sternal rub to check whether they’re responsive,” Michelle Gadot, of the Center for Comprehensive Health Practice, told the festivalgoers gathered around her tent, rubbing her knuckles against her chest to demonstrate. Construction worker Chris Gonzalez, 30, toyed with his blue polypropylene Narcan kit containing two doses of naloxone, rubber gloves, alcohol wipes and an instruction booklet. He was determined to learn how to prevent overdoses, he said. Nowhere in Manhattan has the opioid crisis hit harder than in East Harlem, where the death rate from overdoses has nearly doubled since 2015, Department of Health data shows. The neighborhood ranks third in the city for opioid-related deaths per 100,000 residents, and 36 East Harlem residents died of opioid overdose last year. The opioid overdose death rate among East Harlem residents is 50 percent higher than the citywide average. Citywide, the rate of drug overdose deaths has increased for seven consecutive years as the national opioid epidemic continues to rage. 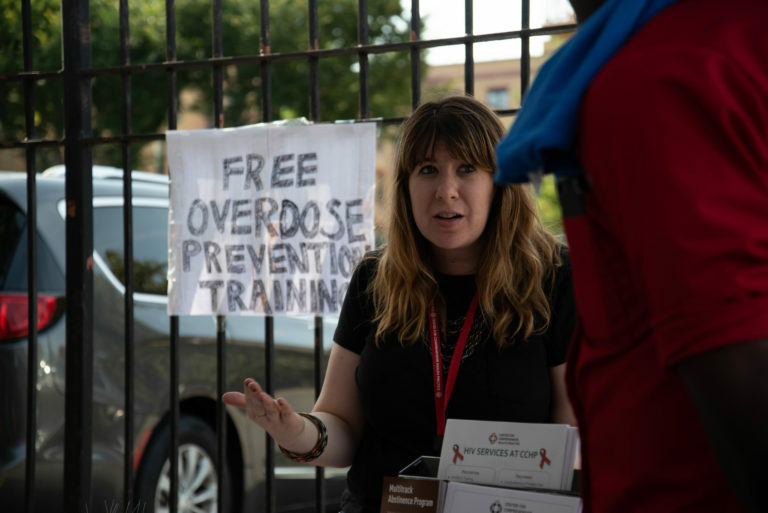 Michelle Gadot led overdose prevention training sessions. Even as deaths increase, one thing about opioid use in East Harlem hasn’t changed since the 1960s, when musician Lou Reed made 125th Street and Lexington Avenue synonymous with heroin. That corner remains the epicenter of a five-block radius of drug use and sales, officers from the 25th Precinct said at a recent community meeting. East Harlem treatment providers are noticing large increases in the number of patients seeking help. Maricella Gilbert, director of the substance abuse treatment facility Greenhope Services for Women, said the number of clients with opioid addiction has increased by around 20 percent over the past five years, with many more attending methadone programs. The perception in East Harlem is that the current opioid epidemic has only generated national headlines because its primary victims are white, said Carey King, director of the local business association Uptown Grand Central, which sponsored Party on Park. The face of addiction in East Harlem is also changing. In the past, clinics say, they treated more black patients. Now, more of their clients are young whites. “Almost without fail, they tell me there was an incident in their life – a car accident or something else where they were prescribed opioid pain pills and that’s why they’re sitting in my office,” said Rachel Heyman, director of the Center for Comprehensive Health Practice’s methadone clinic. Citywide, whites have the highest rate of opioid overdose deaths, but only among black New Yorkers is the rate of heroin overdose deaths increasing, according to the health department. Answering the question of why East Harlem has been particularly hard-hit means examining the neighborhood’s past. As East Harlem’s urban landscape changed, so have patterns of drug use and sales, said Myles Matthews, an aide to former Rep. Charles Rangel (D-NY) in the 1970s and 1980s. Back then, he recalled, he begged developers to purchase vacant buildings for rock-bottom prices to keep out drug users. With redevelopment came treatment centers. East Harlem has been a hub for opioid treatment services since the ’70s and early ‘80s. But with the facilities came loitering and neighborhood blight, even as patients received life-saving treatment. Many in the neighborhood argue that the concentration of substance abuse services in East Harlem exacerbates the crisis they’re meant to treat. For years, locals have argued against placing more opioid-related services in East Harlem. Last week, the Mt. Morris Community Improvement Association unanimously opposed a Mount Sinai proposal to locate another treatment clinic near Marcus Garvey Park. And in Central Harlem, Manhattan Community Board 10 declared a moratorium on new substance abuse services as far back as 2008. As grim as the drug scene of the ‘70s was, Matthews and others said drug use in the area is no better, despite East Harlem’s growing cachet among real estate developers. Cecile Charlier, who has lived across the street from Marcus Garvey Park for 20 years, said that her block has turned into an “open-air drug market. people sitting on the sidewalk across the street from me, and openly selling drugs.” Her 14-year-old granddaughter circumvents the park on the way home from school. Charlier has written to the police three times about drug sales, but from her living room window, she still sees people exchanging cash for glassine bags of powder. In Manhattan, arrest rates for drug possession have fallen by nearly half in the past 10 years, the Manhattan District Attorney’s office said. And some of those arrested for drug possession in Northern Manhattan may never see the inside of a jail: A new pilot program gives them the opportunity to seek treatment instead of going to court. Anti-overdose trainings and free Narcan kits are also part of the campaign to end overdose deaths. At Party on Park, shadows lengthened in the afternoon sun as organizers packed up tents, flags and balloons. But a crowd remained at Gadot’s tent for nearly an hour after the festival officially ended, waiting to receive Narcan kits. Kareem Rahim, 75 and Arkil Shakur Killbrew, 69, were among the latecomers. They met while serving time together at Auburn Correctional Facility. Killbrew, a volunteer culinary instructor at the Henry J. Carter Specialty Hospital, said he wanted to get trained to help East Harlem. Arkil Shakur Killbrew and Kareem Rahim received Narcan training together at the Party on Park block party.